The monster in the title takes many forms. It is an ancient spirit in a Yew tree, a nightmare, cancer, death, illness, humanity, a caring grandmother, an almost always absent father, a group of bullies and the protagonist himself, Conor. The concept was created by Siobhan Dowd, but sadly she died of breast cancer before she could start writing. The task was taken on by Patrick Ness but he made no attempt to replicate Dowd's voice. This is a brave novel. It tackles many young adult themes – peer pressure, family relationships, bullying and school. There is a touch of the paranormal too in the story. It also brings us face-to-face with death and illness; some of the descriptions of Conor's mother's illness are quite graphic. 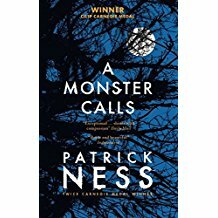 Conor is not altogether likeable yet Ness manages to make us empathise with him. In the end, it is up to the reader to decide exactly who or what the monster is. For sure, it brings some wisdom and poses many questions.